In a text like the one in the picture on the right, with both Chinese characters and Pinyin, what do you look at? Most students look at the familiar letters, and you need to be very familiar with characters to ignore Pinyin altogether. 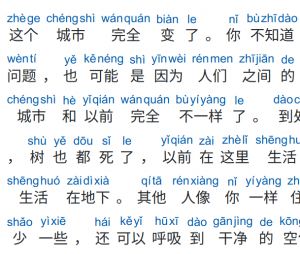 This problem is known by teachers and textbook writers, which is why Pinyin only appears early in beginner textbooks or is placed on a different page. Some gradually remove Pinyin or add it only for new words, others never show both together outside of vocabulary lists. Some system is necessary when learning Chinese characters for the simple reason that the characters themselves at best only contain clues to how they are pronounced. A bridge is needed from the spoken language to the written language. Which system you use to write the sounds is beyond the scope of this article, but if you want to read about alternatives to Pinyin, check out my series about transcription systems, beginning with this article: Learning to pronounce Mandarin with Pinyin, Zhuyin and IPA: Part 1. The main difference between native speakers of Mandarin and foreign adult learners when they learn to write characters is that the former already know how to speak and the latter typically do not. Chinese Children need to connect the spoken language with the written language. 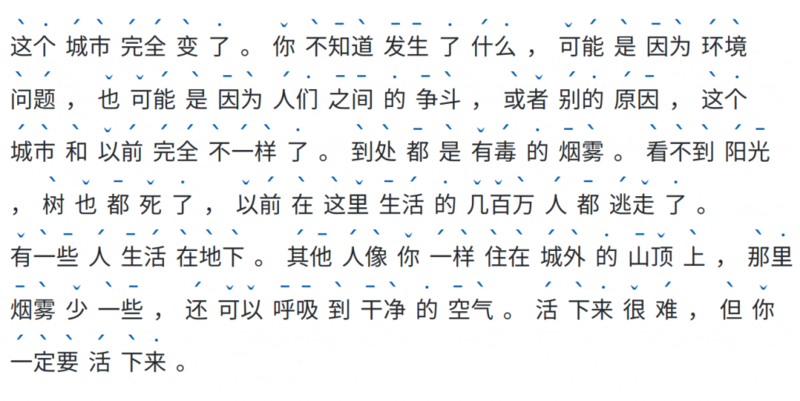 As stated in the first paragraph, the problem with including Pinyin with Chinese characters is that rather than working as a bridge connecting spoken and written language, Pinyin often steals all the attention and students simply ignore the characters. This is incredibly hard to avoid, even if you know that it’s a problem. If your goal is to learn spoken Mandarin and simply need a convenient way to write things down, then using Pinyin is not a big problem. However, if you want to learn how to read Chinese, the more you rely on Pinyin, the longer it will take you to learn how to read. This is because reading Pinyin and reading characters are two very different processes. Sure, they overlap in some ways, but the challenge when learning to read Chinese is to process the characters accurately and smoothly. You will never learn that by using Pinyin. Read more about this problem in this article over at Mandarin Companion: Pinyin over Characters: The Crippling Crutch. 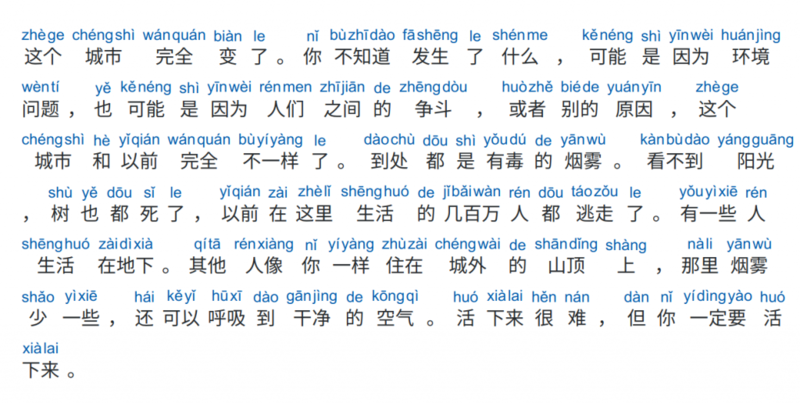 In today’s world of digital learning resources, there is little reason to use Pinyin. Before the advent of pop-up dictionaries and digital reading, Pinyin was crucial. I remember a book I used during my first semester of learning Chinese (汉语口语速成基础), which had no Pinyin for example sentences. It used to take us hours to just figure out what the characters meant by painstakingly looking them up by radical. Since then, a digital revolution has taken place, radically changing the way we learn and teach Chinese. In this article, David Moser discusses the new paperless revolution in Chinese reading and how it affects how Chinese is learnt and taught. In short, you don’t need Pinyin to look words up anymore. The only reason to use Pinyin is as a pronunciation reference, or as a memory aid for spoken language in case your goal is not to learn to read Chinese characters, at least not for the moment. Taking the step from Pinyin to only characters can feel very daunting, but you’re not going to learn to read Chinese any other way. However, I think some scaffolding can be helpful, while still allowing you to learn to process Chinese characters. I’m talking about showing information about tones without including Pinyin. To understand why this is helpful, we need to realise that there are many different kinds of tone problems. One of them (number three in the article I just linked to) is the problem of remembering the correct tone. I think this is a problem common for all learners, from beginners all the way up to advanced learners. I’ve encountered the problem many times and still do. It’s not that I can’t pronounce the tones, it’s just that I sometimes don’t remember which one it’s supposed to be! Now, if you read a text without any annotation at all, this problem could in theory persist forever. You receive no feedback and no-one notices if you don’t know the tones of some of the characters, perhaps not even yourself. If you annotate the text with tones, you get the benefit of reinforcing your knowledge of tones while still avoiding the distraction of Pinyin. This is particularly useful for reading aloud, which is hard enough as it is. There are two simple ways you can add information about tones to a Chinese text without also adding Pinyin. You can either use colours or tone marks only. The link between the colours and the tones is completely arbitrary, of course. There are in fact many different colour schemes, which is one of the disadvantages of using colours unless you always have control over which scheme is used. This particular tool actually allows you to choose among several colour schemes, but you don’t always create your own learning materials. Another disadvantage with using colours is that because the choice of colours is arbitrary, there’s an extra step between seeing the colour and recalling the correct tone. This can be learnt, of course, but still takes some getting used to. Update: After writing this article, I e-mailed Purple Culture to ask them if it were possible to add a dot for neutral tones. They have now updated their tool so that is adds dots for neutral tones! The above picture represents this new output rather than the original version which had nothing at all above characters with neutral tones. This takes a bit more space since an extra line is needed, but that’s seldom an issue. I personally find this method more appealing because it gets rid of the arbitrary colours and sticks to tone marks, which are directly linked to the contour of the tones. I also feel that reading this text is much closer to reading normal text, because it’s easier to disregard the tone marks and only look at them when needed, whereas the colour of the characters in the previous example is impossible to ignore. Still, to each his or her own! I think both methods work and they serve the same purpose. While we still don’t really know if either method would help student learn the tones better (see the first article in further reading below), but they definitely provide some scaffolding to your Chinese reading experience, while still keeping you on the task of learning how to process actual characters. Which method do you prefer? 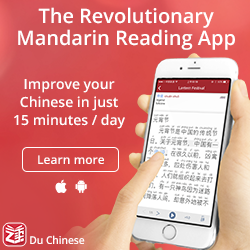 What’s your experience with Pinyin in relation to learning to read characters? Leave a comment! Godfroid, A., Lin, C. H., & Ryu, C. (2017). Hearing and Seeing Tone Through Color: An Efficacy Study of Web‐Based, Multimodal Chinese Tone Perception Training. Language Learning, 67(4), 819-857. Wang, X. (2008). 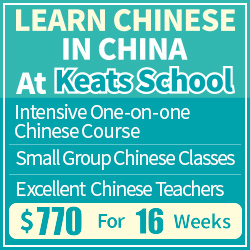 Training for learning Mandarin tones. In Handbook of research on computer-enhanced language acquisition and learning (pp. 259-274). IGI Global. There is some evidence to suggest that the content of coloured print is less likely to be memorised. That may also apply to characters, although the research concentrated on our (and specifically English-language) print. My experience suggests that, short of using vertical script with “bopomofo”, tone markings can be helpful. Perhaps it’s best to mark neutral tones, so that the spacing is retained. I sometimes use a dot. I e-mailed Purple Culture about this and they replied almost immediately saying that they have now added that feature. Neutral tones now have dots! They are still slightly misaligned, but not enough to be a real issue, I think. 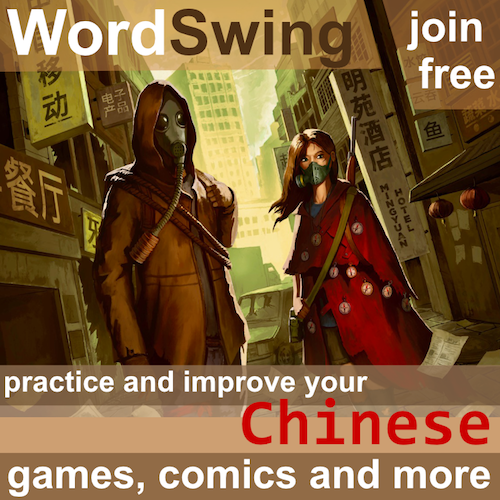 I’ve done HSK 1 and 2, which gives pinyin and allows you to ignore characters. And I was really happy, that a beginners book has pinyin under the characters. Now it’s distracting. But it helps with unknown words and characters. On the other hand, I have an HSK3 preparation book without pinyin (they say, because HSK3 is without it) and I think it is really hard to use and I wish somewhere would be pinyin. Your article is as useful as usual! 🙂 There’s one point I’d like to add: The neutral tone is recommended to be marked as ˙ above. It can indicate that the unstressed syllable is usually short in a word or phrase (unless the overall intonation affects its length). In fact, according to The Flexible/Adaptive Rules (变通规则) in the PRC’s Basic Rules of the Chinese Phonetic Alphabetic Orthography (汉语拼音正词法基本规则 in Simplified Chinese Characters; lit. Hanyu-Pinyin[-Romanization]-Orthography Basic-Rules), it is legitimate to put a middle-round dot (perhaps a middle dot in Unicode) as the neutral tone mark preceding a bound or free unstressed syllable. Similarly but in a different way, according to the Chinese version of the Explanatory Table of Tonal Marks (調號說明表) in the ROC’s Manual of the Phonetic Symbols of Mandarin Chinese (國語注音符號手冊 in Traditional Chinese Characters; lit. Mandarin-Phonetic-Symbols Handbook), it is legitimate to put a short horizontal (perhaps a macron in Unicode) as the first tone mark in the upper right corner of the last symbol. Oh, thanks for reminding me about this! I totally forgot about it, but I relied heavily on that when responding to student feedback for Skritter vocabulary. For example 现代汉语词典 uses the annotation with the dot. I’ve reached the point where I find the pinyin to be a distraction because it’s so easy to read. I find myself often covering up the pinyin row while reading. The tone marks are an excellent idea, because I’ve not reached the point where I can be 100% sure of my tone, even if I know the character and meaning. I will definitely check out that tool. I am only at HSK 2 level but find colors helpful when learning the characters. I marked my flashcards with dark colors (lighter ones are harder to read/remember) and I do remember the color/tone right away with the word. I even use the color coding with my pinyin despite the fact that it already has the tones. However, I am a very visual learner, it might not be helpful for everyone. Thank you for this helpful post. 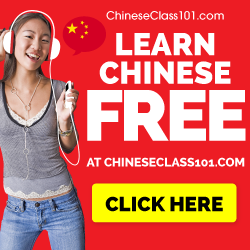 The Pinyin addiction is real – I have been studying Chinese with my children for 3 years and I still have a hard time ignoring Pinyin when it’s present. I love the idea of just including tone-marks. At first, I was concerned that the marks could be result in the character being memorized incorrectly (eg, confusing the tone mark as part of the character when you are trying to write from memory). But I think the use of a different color (as you have shown) should prevent that confusion. I will try using Purple Culture for this feature!